A Hot Seat in Milwaukee? Now I, like most MLB fans, like a good underdog story which seemed to be what we were getting from the Milwaukee Brewers most of the season this year. It was great! But it just seems that seasons like this never last for the Brew Crew. We as fans always root for David to beat Goliath (in this case the Cardinals) but he just seems to always have his way in the end. It was sad to see a team that was pieced together with band-aids, could go as far as to lead the National League Central Division for most of the season. But losing in the end and not making the playoffs shows me that they need change. Most people would say that the easiest change to make for a team that seemed to collapse would be to fire manager Ron Roenicke. But I say lets not jump the gun. 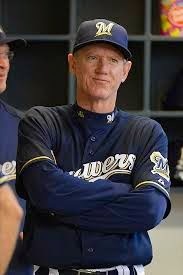 As a manager, Roenicke has led the team to the playoffs in the past and it could be said that he was the reason that the Brewers got off to such a fast start. Roenicke may be on the hot seat, but it's because it always comes with the position. But if you dive deeper into the organization you will see that he was set up to fail. Management in the Brewers organization has always been very tight with money. This is understandable being in Milwaukee. But even the smaller markets go out and spend money when they know they have to. Just to give management some credit, they did go out and try to solidify first base, but they went about it all wrong. They brought in Mark Reynolds and Lyle Overbay. Now Overbay was at one point a very solid first baseman hitting over .300 in the early part of his career and playing solid defense. But he is now 37 years old. He doesn't have the same ability that he used to. He is I hate to say too old. There other option (which they stuck with for a majority of the year) was Mark Reynolds. Reynolds has played some first and third base, so his versitility is what really helped him earn a spot on the team. But he is an all or nothing guy. He played pretty solid defense, but his bat was lacking. He hit .196 with 22 homers and 122 strikeouts. Without question he still has some pop in his bat, but that's only when he makes contact with the ball. Neither of these players were good options at first base but that's all Roenicke had to put there. Another thing management went out and did was trade a star outfielder in Norichika Aoki for a bullpen pitcher Will Smith. This ended up being the best move they made this season. Will Smith seemed to be dominent all season and only started to struggle because he was being over used. he was being over used because there wasn't a solid bullpen for Roenicke to turn to. Add bad management decisions, players getting hurt, and players just not playing to there potential, and it begins to explain why the Brewers fell apart at the end of the season. Roenicke should not be the one that should be blamed. He can only do so much. He can't run out there and make the plays for the Brewers.